Mozes van de Rhoer (born in 1879) a merchant, lived at 32 2nd Hoofdstraat. From his marriage to Bertha van Gelder a daughter named Martha was born. 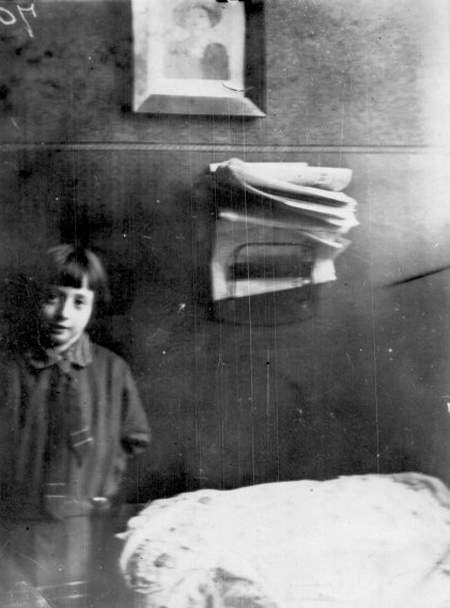 After Bertha’s death in 1913, Mozes married her sister Rebekka (born in Groningen in 1886). From this marriage daughter Sonja was born in 1921. Martha van de Rhoer and her father Mozes. Mozes traded in cattle, and was well thought-of with the farmers in the area of Meppel. Often he would be trusted with the sale of their animals. They always got a good price, and were never disappointed. Without doubt, Rebekka was popular with the kids; she ran the sweet shop Lido, which was established in the same building as where they lived. Sonja, a spinster, still lived at home and worked as a nurse. Martha no longer lived at home. Just before the Jews were removed from Meppel, Martha married Bram van Es. The ceremony was held at the home of the Van de Rhoer family, at 14 Grote Kerkstraat. They had been evicted from their home in the Hoofdstaat. 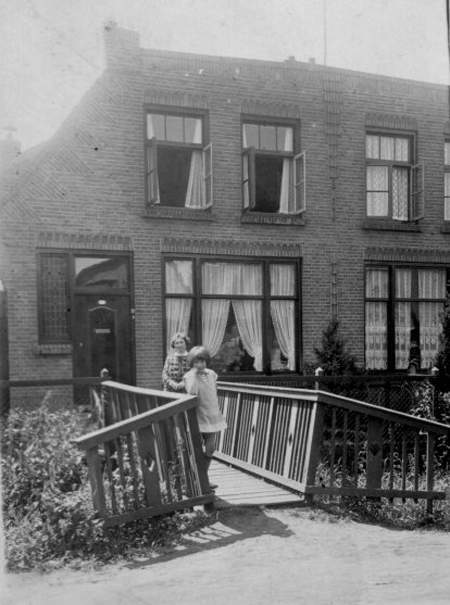 Sonja van de Rhoer and her mother Rebekka in front of their house on the Blankensteinweg. Different from other Meppel Jews, Bram had already been sent to a labour camp (in Vledder) because he no longer lived in Meppel. His father Coenraad van Es, who lived on Steenwijkerstraatweg at that time, had quite some trouble with his son. On Thursday the 10th of June 1942, he reported to the police that a bicycle he had sent by carrier transporters to his son, who was a cook at the labour camp in Vledder, was missing. Later on the bicycle was found back in Ruinen unattended. On the 12th of September Bram had again lost something; this time, a suitcase with contents. When he suddenly had to move from camp Vledder to Orvelte, he was unable to take the suitcase with him, so he asked a stranger to send the suitcase to his parents in Meppel. It never arrived. Bram suspected a colleague of his (De Bruin, a cook in camp Vledder) of stealing his suitcase. Father Van Es asked the police to investigate, without result. Mozes van de Rhoer was sent to the labour camp in Orvelte on the 3rd of July 1942, and he probably saw his parents back on the 3rd of October in Westerbork, where they stayed until the 6th of November. Rebekka, Sonja and Mozes were transported to Auschwitz on the 9th of November, where they died. It is most likely that they saw their son-in-law Bram, who was in the camp then as well. He died in the gas chambers of Auschwitz on 1 October 1944. 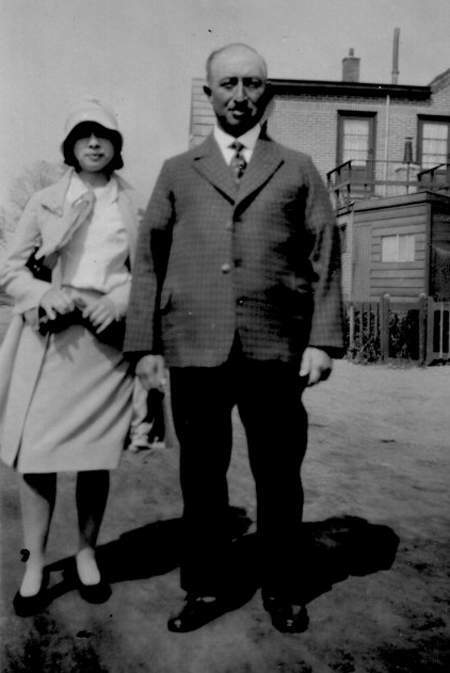 His wife Martha (born 25 September 1913) was in hiding and has survived the war. She must have been extremely worried about her young husband. They may have corresponded with each other. Martha died in Amstelveen on the 29th of October 2001.